Last week I posted my updated morning skincare routine. 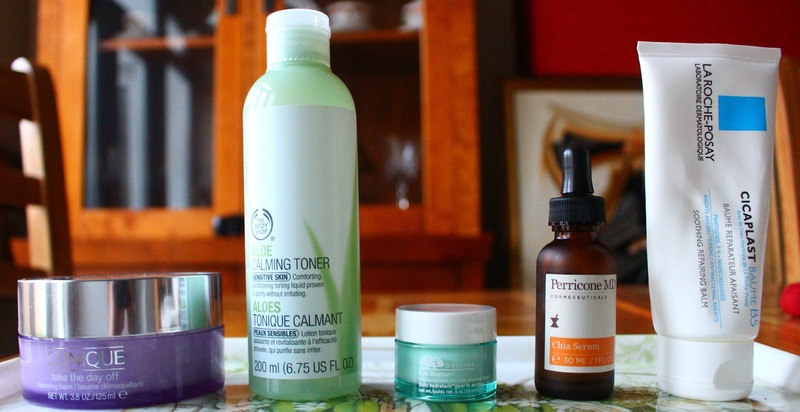 Today, I'm sharing my evening skincare routine. Clinique Take the Day Off Balm (£22) is perfect for the evening. It removes everything. Makeup, dirt, pollution, it's all gone. I prefer removing it with a hot face cloth to get a deep clean and light exfoliation. It's a really good cleansing balm for beginners. I use the same toner day and night so you all know it's The Body Shop Aloe Toner (£8.50). A small amount on a cotton pad swept all over the face and eyes, both sides. Done. Again, I use the same eye cream day and night. This Winter I've switched to the Origins Eye Doctor Eye Cream (£28.50). It's beautiful. Using my ring finger, I dab a small amount under the eyes and on my eyelids. I know putting eye cream on your eyelids is a bit unconventional but my lids get very dry and dehydrated. I feel like I'm beginning to sound like a broken record but I do use a lot of the same products morning and night. For serum, that's the Perricone MD Chia Serum (£62). This stuff is good. Nourishing and hydrating. Just like I do in the morning, I use one drop patted into my skin at night. This is something that does change in the evening. I'm still loving the La Roche Posay Cicaplast Baume B5 (£11.45-£16). It does the job well; it deeply hydrates but doesn't feel heavy. I will admit that I'm getting a bit bored with it. I want a change but I'm a little bit scared to try something new. I have no idea what to get! I really like the look of the night creams from Origins but they are so expensive! So that's both my skincare routines done for the season. I'm sure I'll do another one of these as we head into Spring and Summer but for now, I can't see anything changing. What's your favourite Winter moisturiser?